With the rest of the country absolutely freaking out about the subzero temperatures and all that, we thought it would be a good time to remind everyone about maintenance that should be done before we get to the really hot time of year. Of course that is a little ways off but it will come around soon enough. Like many of those people up north have to perform all sorts of rituals to get their vehicles ready for winter, those of us that live in San Diego should think about summer the same way. How many times have you been on the 805 and passed a car spewing white smoke from the engine compartment? Those people look miserable, especially in the heat. Don’t be like them, get to Kearny Mesa Automotive and Transmission before everyone decides it is time to get their vehicle ready for summer. What is the most important thing when you look for when you buy a car? The radio? The power of the engine? Nope and Nope. The most important option is the air conditioning. Now this time of year you probably don’t think about running the A/C but make no mistake, every time you turn on the defrost setting, the system is running. It may not be blowing cold air but it is working. This is to keep the compressor running and oil circulating through the system. While this is great and all, you really have no idea if it is going to work when the mercury begins to climb. Just like you never think of going to the bathroom before you get into bed, most of us will not have the A/C system checked over before the heat invades. Bring your car in to Kearny Mesa Automotive and Transmission to have your A/C checked by one of our ASE Certified mechanics. Do you know why those poor souls are stuck on the side of the road surrounded by billowing smoke? Either the car is on fire or the cooling system has some serious issues. Your cooling system is your engine’s only prevention between running at a sensible temperature and exploding beside the highway. The cooling system consists of antifreeze, a water pump, radiator, thermostat, and belts. The water pump circulates the coolant through the engine, carrying heat away from critical parts of your engine. Iany of the components are not working, or there is a hole in the system, your vehicle will overheat. In order to prevent this, your cooling system should be checked over at least once a year. Many times this will include a flush and fill of the antifreeze. 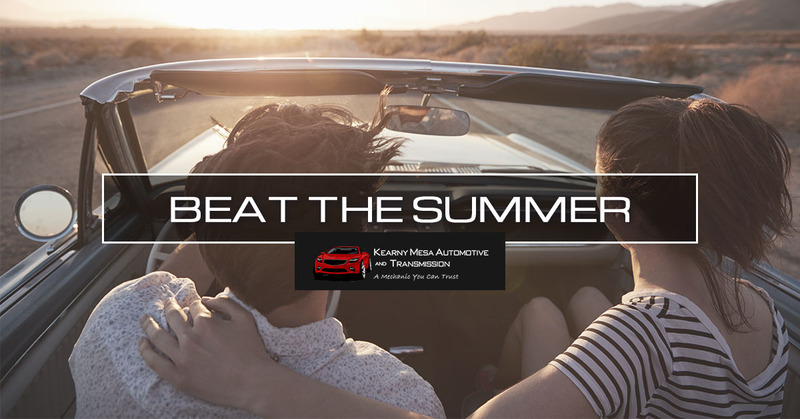 Let Kearny Mesa Automotive and Transmission check over your cooling system and be ready for summer. When you bring your car to the professionals at Kearny Mesa Automotive, you are relying on us to fix the problem right the first time — an expectation that we do not take lightly. So give us a call and make an appointment for your pre-summer vehicle check up today.